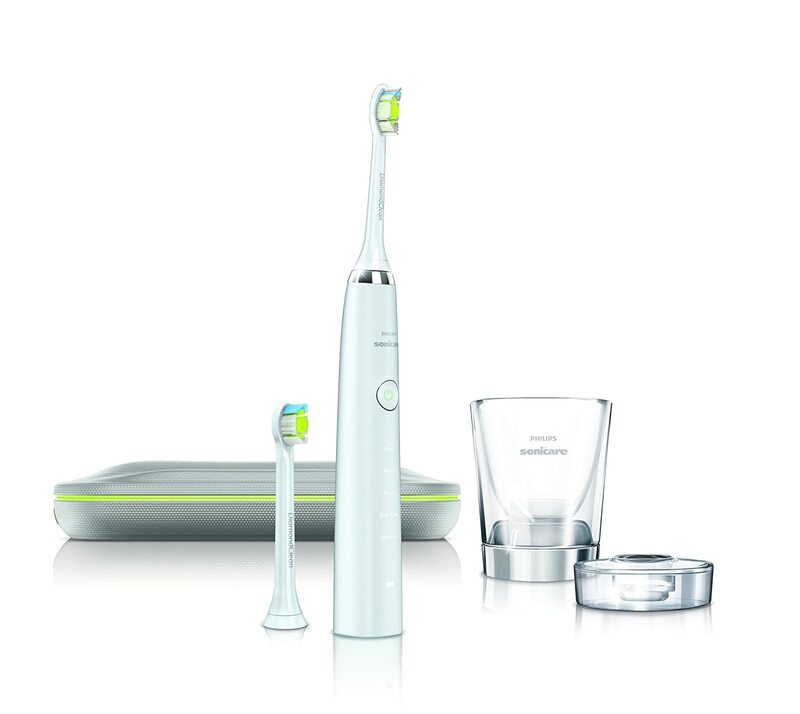 Not so long ago Philips has released their most advanced electric toothbrush, the Philips Sonicare DiamondClean (model # HX9332). This product features the most advanced teeth and gum cleaning technologies available at the moment. Scientists have proven to that this brush will help you to get rid of more than 99% of plaque from hard to reach places of your mouth. Mostly it is due to the new angled design of DiamondClean toothbrush head that allows better get to the back teeth which usually suffer from inadequate cleaning. Studies also show that this brush will improve the condition of your gums after using it only for a couple of weeks and make your teeth couple of shades whiter at the same time. So it will not only clean the teeth more thoroughly than other oral care products but also take care of your gums and even reduce the gum sensitivity. Diamondclean toothbrush features sonic technology which is unique to the brand. The said technology can produce great teeth cleaning action which provides users with results fast. It works by gently whipping the toothpaste and saliva into an oxygen-rich foamy liquid and drive it between and behind the teeth and on the gum line where bacteria usually accumulate. 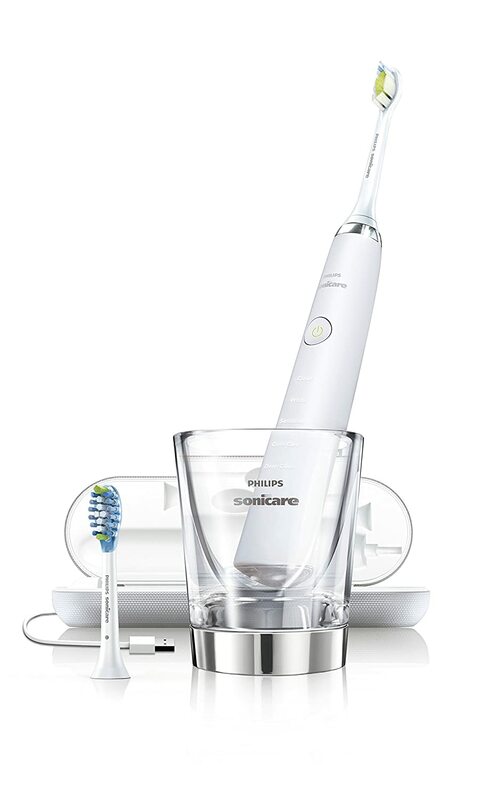 Philips Sonicare’s sonic technology is gentler than a manual toothbrush making it useful in keeping your teeth healthier over an extended period of time. 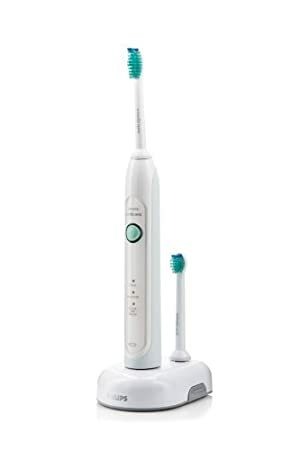 This brush has the two regular timer features – Smartimer and Quadpacer – you might be familiar with from older Philips toothbrushes. Smartimer is a simple 2-minute timer that makes sure you are brushing for 2 minutes as dentists are suggesting. Quadpacer beeps every 30 seconds to inform you that you should move to the next quadrant of your mouth. This way you will spend equal time on all parts of your mouth. I have noticed people mentioning that DiamondClean Smartimer works a bit different from previous Philips models. Smartimer used to beep when 2 two minutes were up, and the brush kept working as long as you switched it off. The DiamondClean version of Smartimer switches the brush off when the brushing time is up. If you want to do some more brushing, you should start another brushing cycle. What makes the DiamondClean brush to stand out is its five different brush modes that have been designed for different purposes with dental professionals’ advice in mind. If you have sensitive teeth, the Sensitive mode has been designed for you as it uses an extra-gentle method of brushing. This toothbrush can work up to 3 weeks from one charge. It is indeed above average. Brush features a Lithium-polymer battery which is responsible for longer working time. DiamondClean features new inductive charging technology. It means that the brush does not have to be plugged in the charger anymore. It is sufficient just to put it on the charging surface. There are two charger accessories bundled with the brush. The DiamondClean features an innovative USB travel case which also works as a charger. You can connect it to the computer’s USB port or use the included USB AC adapter and have your toothbrush charged while it is sitting in the case. This is a great feature to have, particularly if you are often traveling. This toothbrush has a chrome base that features a charging glass that has two purposes. It can be used for mouth rinsing, and because it also has the latest in the conduction technology, it can charge your toothbrush as it rests in the glass. People will be able to have a more efficient brushing experience thanks to Philips Sonicare DiamondClean brush heads that now have a new diamond-cut design. The brush head provides the user with more effective plaque removal and whiter teeth as it has 44% more bristles than the previous ProResults brush heads. There are two different sizes of brush heads which are Standard and Compact. When it comes to its design, the DiamondClean is simple and stylish. Its handle has a ceramic finish, and its well-designed neck is highlighted because of the chrome accent ring. Its electronic displays on the handle are hidden so that it does not interfere with the sleek white finish of the rechargeable toothbrush. Now, this brush is also available in pink. Amethyst Edition is the latest addition to this product line. Black finish was one of the first additions. People often have a hard time to make a choice between DiamondClean and former Philips top of the line brush Sonicare FlexCare Plus. If you also have not decided between these two brushes, read our Sonicare DiamondClean vs FlexCare Plus article. Another alternative to Diamond Clean brush is Sonicare HealthyWhite, so I have also compared these brushes in the chapter below about DiamondClean vs Healthy White differences. Here is a comparison of 2 popular toothbrushes from Philips – DiamondClean and HealthyWhite. Review Read our review! Read our review! If you are looking for an advanced toothbrush that has innovative features and a great design, look no further than the new DiamondClean toothbrush from Philips Sonicare.